Registration4All is adaptable to all types and all sizes of events. Registration4All is an all-inclusive hands-on operation, covering all the technological aspects of the event. Registration4All enters into contract with the event timekeeper, accompanying him, to ensure a service in respect of all the norms and specifications defined by Registration4all. 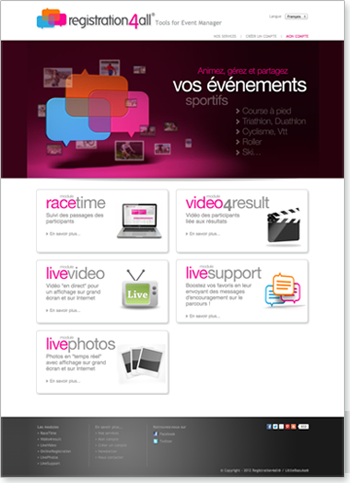 A « rental » service is available to all races, whatever their size, which includes transportation and set-up of Registration4All’s equipment, including RaceTime spécial Trail and Video4Result. Provision of giant LED screens with operators.